Home › Electronics › Samsung Micro Usb Charging Data Cable For Samsung - Non-Retail Packaging - Wh..
Samsung Micro Usb Charging Data Cable For Samsung - Non-Retail Packaging - Wh.. This Micro USB cable for Samsung devices connects your phone to your computer for data syncing. You can manage your data from music, videos, pictures and more. The 5 FT cable gives you enough reach so you can use your phone and charge it at the same time. This Micro USB cable for Samsung devices connects your phone to your computer for data syncing. ^The Samsung 5 FT Micro USB Charging Data Cable can also be used with a USB travel or car charger for fast charging. With this cable ^You can manage your data from music, videos, pictures and more. ^The 5 FT cable gives you enough reach so you can use your phone and charge it at the same time. 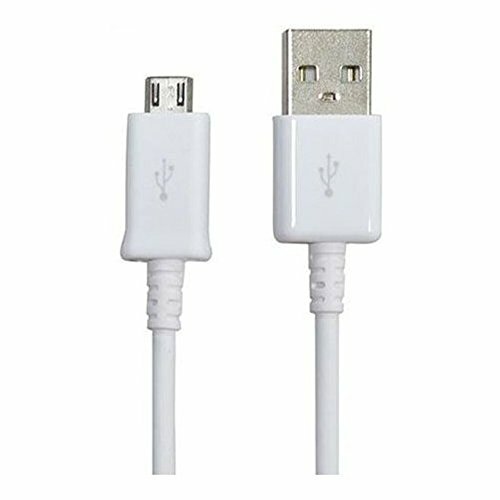 Offer Type: Single Pack | Product Packaging: Standard Packaging This Micro USB cable for Samsung devices connects your phone to your computerfor data syncing. The Samsung 5 FT Micro USB Charging Data Cable can also beused with a USB travel or car charger for fast charging. With this cable, youcan manage your data from music, videos, pictures and more. The 5 FT cablegives you enough reach so you can use your phone and charge it at the sametime. OEM Part Numbers: ECB-DU4EWE/ECBDU4EWECompatible with the SamsungAcclaim R880, Admire R720, Array M390, ATIV Odyssey i930, ATIV S Neo SPH-I800,A187, A197, Brightside U380, Behold 2 T939, Caliber R850, Captivate i897,Captivate Glide (i927), Character R640, Chrono R260, Chrono R261, Chrono 2R270, Code i220, Comment R390, Conquer 4G D600, Continuum i400, Contour R250,Contour 2 R720M, Convoy 2 U660, Convoy 3 U680, Dart T499, Droid Charge i510,Double-time i857, Entry (M270), Eternity II A597, Evergreen A667, Exec i225,Exclaim M550, Exhibit 4G T759, Exhibit II 4G T679, Exhilarate (i577), Epic 4GD700, Epic Touch 4G D710, Factor M260, Fascinate SCH-i500, Flight A797, FlightII A927, Focus i917, Focus Flash (i677), Focus S (i937), Focus 2 (i667),freeform R350, freeform R351, freeform II R360, freeform III R380, freeform 4R390, freeform 5 R480, freeform M T189N, Galaxy Ace S5830, Galaxy Ace 2,Galaxy Ace 3 GT-S7272, Galaxy Admire 4G R820, Galaxy Appeal (i827), GalaxyAttain 4G R920, Galaxy Axiom R830, Galaxy Discover SCH-R740C, Galaxy ExhibitT599, Galaxy Express i437, Galaxy Grand i9080, Galaxy Grand i9082, GalaxyIndulge R910, Omnia 2 i920, Omnia 7 i8700, Rant M540, Reclaim M560, RealityU820, Replenish M580, Repp R680, Restore M570, Rugby 2 A847, Rugby III A997,Rugby Pro (i547), Rugby Smart i847, Seek M350, Smiley T359, Solstice II A817,Stratosphere i405, Stratosphere II i415, Stride R330, Strive A687, Stunt R100,Suede R710, T159, T249, T369, T-Mobile Sidekick 4G, Transfix R730, TransformM920, Transform Ultra M930, Trender M380, Two-step R470 and Vibrant T959 phonemodels.